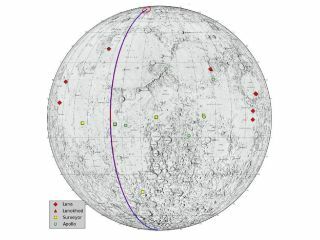 This graphic highlights locations on the moon NASA considers "lunar heritage sites" and the path NASA's Gravity Recovery and Interior Laboratory spacecraft will take on their final flight. Image released Dec. 13, 2012. Two NASA moon probes are slated to slam into the rim of a lunar crater today (Dec. 17), and the space agency will give viewers a behind-the-scenes look at the dramatic action. The twin Grail spacecraft, known as Ebb and Flow, will crash intentionally near the moon's north pole at 5:28 p.m. EST (2228 GMT) today, bringing their gravity-mapping mission to a spectacular close. The event will be broadcast on NASA TV and streamed live on the agency's website, beginning at 5 p.m. EST (2200 GMT). The coverage should last about 35 minutes and will include interviews with Grail team members. The impact site will be in shadow at the time of the crash, so no video of Ebb and Flow's violent demise is expected, NASA officials said. You can follow along at NASA TV's website (http://www.nasa.gov/multimedia/nasatv/index.html), or watch the feed here at SPACE.com. The $496 million Grail mission launched in September 2011 and arrived in lunar orbit about three months later. Ever since, Ebb and Flow have been zipping around the moon in tandem, detecting the tiny changes in the distance between them caused by lunar mountains, craters and subsurface mass concentrations that affect gravity. Scientists have used these measurements to create the most detailed gravity map ever constructed for a celestial body. The new map reveals that the lunar crust is almost completely pulverized, suggesting the moon — and the other rocky bodies in the inner solar system — were battered by long-ago impacts far more violently than previously thought. Ebb and Flow are now almost out of fuel. They would have hit the lunar surface eventually anyway, so the mission team wants to bring them down in a controlled fashion. They're slated to hit a crater rim at a latitude of 75.62 degrees north and a longitude of 26.63 degrees east — far from any sites of historical importance on the lunar surface.